Last night at Lytton Hall the club had its latest training session, hosted by club Chairman Bajrush. The session had two parts. In the first part Bajrush presented some common positions featuring rook vs rook and pawn, and posed to us how a win (or draw) could be forced. 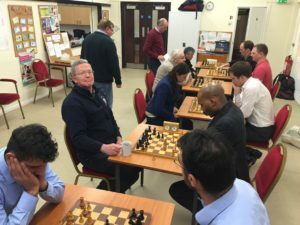 In the second part of the session, the club was split into two teams: Knights and Bishops. 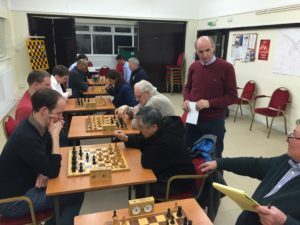 Each player lined up against someone from the other team and played three moves each on a board, then moved with their opponent to play three moves on the next board, which had already been played on by a different pair. A pair of players would drop out when one checkmated the other. This session was great fun and forced everyone to examine positions they might not be familiar with. In the end the session finished in a 3-3 tie. The debate over which is stronger out of the Knight and the Bishop will continue!